I’ve never had a post about leather gloves before on here. The reason is,,, well,,, there are so damn many different types of leather gloves out there! So it’s hard to really say just what you should look for or what to get. Leather gloves can be made of just about any type of leather hide, plus have many other fabrics and synthetic material in them. They can be lined or unlined, stiff or soft, tough like iron or delicate to scratches, any color of the rainbow, with or without leather fringes or hardware and on and on. So it can be very confusing if your trying to find a quality pair of leather gloves. One thing I can tell you is, DON’T get “patchwork” leather gloves. Those are the type that has many small pieces of leather sewn together to make the finished product. They are junk and you should not get any type of leather item made from patchwork leather, be it a leather jacket, vest, wallet or gloves. Now, there are three basic types of leather gloves, with variations in each class. 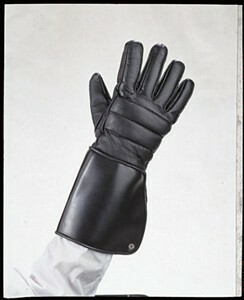 The first is full finger leather gloves like in the pictures above. These are most commonly used as driving gloves, motorcycle gloves, work gloves or just to keep your hands warm. They can be made from many different types of leather hides. Goatskin, lamb, cowhide, pigskin, deerskin, elk skin, buffalo hide and more. For just driving your car or casual gloves you can use the goatskin or lambskin. They are soft and smooth. 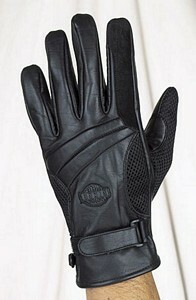 For motorcycle gloves you want a tougher type of leather. Pigskin, cowhide or buffalo hide would be my choice. They still can be very soft, yet protect your hands from scratches and of course if you take a spill. They can be lined or unlined, with or without mesh or holes to let your hands breath and lots of other extras. Next we have fingerless leather gloves. These are used for motorcycle riding, wight lifting or anything else you want to have protection to your hands but want your fingers free. Normally they are unlined, with or without mesh or holes to let your hand breath. Some wear them just to look cool or tough! Finally we have the gauntlet leather motorcycle gloves style. These are normally used for motorcycle riding, but also are worn for work gloves. They have a long, wide sleeve made to go over your wrist so it makes a protective wrap around your shirt or jacket where it comes to your wrist. Often it can be tightened by a drawstring, zipper or button, or buckle. It keeps the air from blowing up your jacket where the wrist is, and protects your arm from road junk or other things when used as a work glove. These are normally made from pigskin, cowhide or buffalo hide. All three are good, tough and work well to protect your hand. As always they can be lined or unlined, meshed or with air holes, plus have other material in them. So as you can see, there is a wide variety of leather gloves to choose from, depending on what your using them for. Most have at least two pairs of leather gloves if your motorcycle riding. One unlined for warmer summer days, and another lined for cold months. 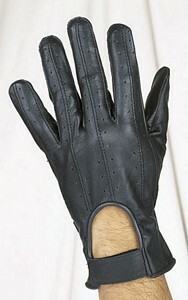 Then you can have many other styles and types of leather gloves for other reasons. Suede leather gloves are popular too. They are soft with a more unfinished look to them. That is, suede leather gloves are not sanded smooth on one, or both sides of the leather. They can be used for driving or work gloves, whatever you want. As always, you should clean, condition and seal, or waterproof your leather gloves. I have a full article on how to care for your leather items here. It’s always the same, be it a leather jacket, boots, pants or gloves. Leather is leather, no matter what it fits over. Hope your not more confused about leather gloves after reading this!